WANDO -- More than 200,000 people have visited a seaweed exposition under way on the southwestern island of Wando since its opening last week, organizers said Friday. 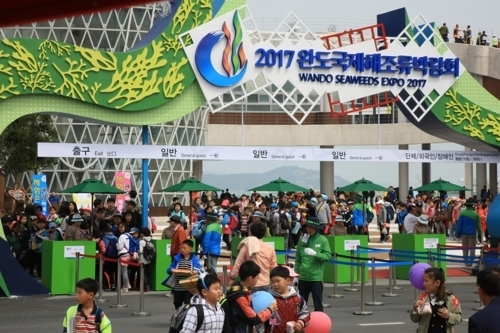 Wando Seaweeds Expo 2017, launched on April 13, is scheduled to run through May 7, they said, hoping to attract over 600,000 visitors. The organizers said they have arranged special admission fees and discount rates to woo more clients. Those who have admission tickets to the expo will be allowed free admission to Wando Tower, the Jang Bo Go Memorial Hall and a folk village. A 30 percent discount will be given to the ticket holders when they enter a film set on Jang Bo Go, the maritime figure who was active in the Yellow Sea region and controlled trade between the ancient Korean kingdom of Shilla, Japan and the Chinese Tang Dynasty in the 9th century. He is known to have created a fleet of fighting ships to defend his maritime rights. Up to a 30 percent discount will also be available on the fare for ferries traveling to nearby islands.